Let your imagination and sense of adventure wander in the Caribbean wonderland that is Seven Mile Beach on the island of Grand Cayman. 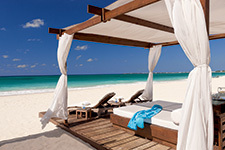 That’s where you’ll discover The Ritz-Carlton, Grand Cayman – an exclusive oceanfront resort catering to those who seek a grander level of relaxation and luxury. Situated on 144 acres stretching sea-to sea from the Caribbean to the North Sound. Valid for booking and select travel through 12/14/19. Rate is per person, land only, based on double occupancy for check-in on 9/17/19, in room categories shown. Unless otherwise indicated: rates quoted are accurate at time of publication, & are per person, based on double occupancy. Airfare, taxes, surcharges, gratuities, transfers & excursions are additional. Advertised rates do not include any applicable daily resort or facility fees payable directly to the hotel at check-out; such fee amounts will be advised at the time of booking. Rates, terms, conditions, availability, itinerary, government taxes, surcharges, deposit, payment, cancellation terms/conditions & policies subject to change without notice at any time. Cruise rates capacity controlled. Other restrictions may apply, including, but not limited to baggage limitations & fees, standby policies & fees, non-refundable tickets & change fees with pre-flight notification deadlines, & blackout dates. Fees & policies vary among airlines. Contact your travel advisor for details or questions. Not responsible for errors or omissions.